Throughout history the game of Solitaire has been one of the all time best ways to pass the time when you are all by yourself. It is and has been known by many names but the most popular are Solitaire and Patience. But whatever it may be called, the point is that it’s a game you play all by yourself. Despite not needing any other players, or perhaps because of that fact, Classic Solitaire is thought to be one of the most popular card games played both with real decks of cards and digital decks found online. Solitaire is the common name for any game using a full deck of traditional playing cards with all the suits and numbers used. The rules vary depending on the game, but the goal is to arrange a specific sequence of cards while working within the restrictions of the specific game. That it’s a popular way to play cards is clear, but its origins are anything but transparent. Click to book your Las Vegas tours. In French, Solitaire means solitary or lonely. A natural name for a game played by only one player. Because the name is of French origin, it’s believed to have began in France but many others believe versions of Solitaire have been played for as long as there have been playing cards. The first documented game with the rules of Solitaire did occur in France originating in the Napoleonic era. There is an interesting historical theory where the game was created by famous French general Napoleon Bonaparte. The story goes that he played the game for years to pass the time during his exile to St. Helena. There is no evidence to prove this but there were many versions of Solitaire around during this period that reference the general in exile including “Napoleon’s Square” and “Napoleon at St. Helena.” There may not actually be a link to Napoleon the man and Solitaire the game. It could be that because the game is played alone and the Little General was in exile at the time that it was a natural nickname. However, it’s a fun historical thought. Literature of this period in France also refers to the game of Solitaire by other names. It was most commonly called “La Belle Lucie” but also Le Cadran, Le Loi Saique, and others. In today’s world the game is referred to in France and England as “Patience” while in North America it has kept its original French name of Solitaire. One of the definitive books about card games of the 17th century is “The Compleat Gamemaster” by Joseph Cotton in 1674. However, this book doesn’t make reference to Solitaire. One of the earliest descriptions of Solitaire in a book of card games actually comes from Russia. It’s found in a book published in 1826 in Moscow called “Sobranie kartochnykh raskludok, izvestnykh pod nazvaniemn Grand-pasiansov” which translates into “A Collection of the Card Layouts Usually Known as Grand-Patience.” Some historians have argued the evidence found in this book means Solitaire may not have been created in France at all, but possibly in Eastern Europe, perhaps in Serbia. Click to book your Las Vegas tours. The best known game book on Solitaire from an earlier era would have to be “The Illustrated Book of Patience” which was written by Lady Adelaide Cadogen around 1870. It’s a book that looks at many different variations of the game. A second edition of the book of rules came out in 1874 and many other collections and publications arrived in the following years. One of the successful books that came out in this period that went over the rules of the game was “Amusements for Invalids” by Annie B. Henshaw. This one was written in the same year as Lady Cadogen’s book and others were written by authors like Basil Dolton, H.E. Jones, and Angelo Lewis. One of the more unique origins of a variation on Solitaire came from Bill Peers. Peers came up with the game of “Cribbage Solitaire” while an inmate in an insane asylum. The asylum considered playing cards of the traditional variety possible to use as a throwing weapon of sorts, so Peers and the other patients had to play his version with thick and bulky tiles with the suits and numbers on them. Another well known version of the game was created by a casino owner called Canfield. This version was tough to win and had extremely high odds or it may have become more popular. Though it was originally called Klondike, the name Canfield is the one that stuck with this version and that`s how it is known today. Click to book your Las Vegas tours. One place you see Solitaire played a lot in these modern times is on computers. Most personal computers and many cell phones and iPods have games of Solitaire on them when purchased. 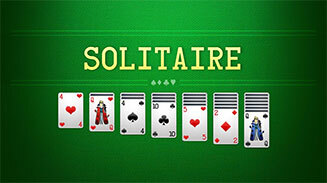 For the first time Solitaire could be played without having any cards at all. While the game was played on personal computers after their invention, with the dawn of the internet it could also be played online. Millions all over the world now play the game online as a quick break from work off a browser or off a software program. A lot of Solitaire sites online can be accessed for free and will have a top score list so that other players can try and beat the records that are set. Chat features are also available that ironically turn the game of Solitaire into a social activity. Some sites even offer cash prizes for the winners of online tournaments. Like many other card games, Solitaire has made the jump from being played with a deck of cards to being played by an even wider audience online. Solitaire’s origins are more than a little cloudy upon close inspection. Historians really cannot even say what part of the world it first came from or exactly when it was developed. Many theories point to France which makes sense given the name Solitaire. Even if it can’t be concluded that it originated in France, it cannot be denied that the French had a strong impact on its development. The game of Solitaire has been enjoyed by all walks of life and the fact that it makes appearances so often in popular fiction from around the world shows how popular it was and how popular it remains today. With the game growing online its popularity shows no signs of slowing down.